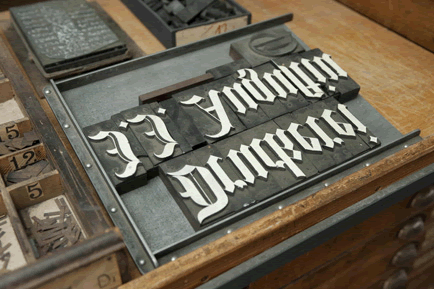 The film producer Christian Bau is in the process of creating a documentary film about Jimmy Ernst (1920-1984), who, between 1935 and 1938, worked as a typesetting apprentice at the Augustin company in Glückstadt, Germany. Jimmy Ernst was the son of the renowned painter Max Ernst (1891-1976) and the art historian Louise Straus-Ernst (1893-1944 in Auschwitz) who, because she was Jewish, fled from Germany to Paris in 1933. The 13-year-old Jimmy remained in Cologne under the care of his grandparents. Because of his partial Jewish heritage, he had a difficult time finding an apprenticeship but Heinrich-Wilhelm Augustin (1878-1938) offered him both protection and an education as a typesetter. When Jimmy managed to flee to America in 1938, he found his first employment with the Augustin subsidiary in New York. The location for the film is the main building of the 377-year-old Augustin J. J. Druckerei GmbH which goes back to the founding of the company and which still houses many pieces of 100-year-old equipment used for the typecasting, typesetting and printing of primarily non-Latin printing materials. It is largely thanks to the efforts of Heinrich-Wilhelm Augustin that the company established its reputation as the »Technical Assistant to Linguistic Scientists« and has maintained it since 1912. 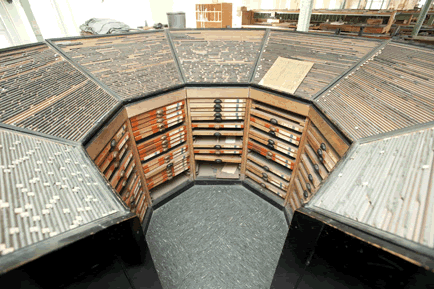 The Augustin company offered typesetting expertise in more than 100 foreign languages including Arabic, Syrian, Persian, Malaysian, Tibetan, even hieroglyphs and American Indian languages. The typesetter Artur Dieckhoff made it a point to study Chinese, and, together with a Sinologist, developed a rational method of setting Chinese type with 18,000 symbols, the so-called »Chinese Compass«. It is to the credit of the present owner of the house, Walter Prueß, that the printing company has retained its historic form. The film which carries the working title »Zwiebelfisch«* is expected to be available on DVD at the end of this year. The accompanying paper contains excerpts from Jimmy Ernst’s autobiography. Of course, set in hot metal type by Augustin. * In America, a »Zwiebelfisch« is known as a »Printer’s Pie« or »Pied Type« – pieces of metal type which have been misfiled in a type case or misplaced during the typesetting process.